GC GCU CGU GUC tBGA U AAU GGC GCA AUG. Figure 10.6. 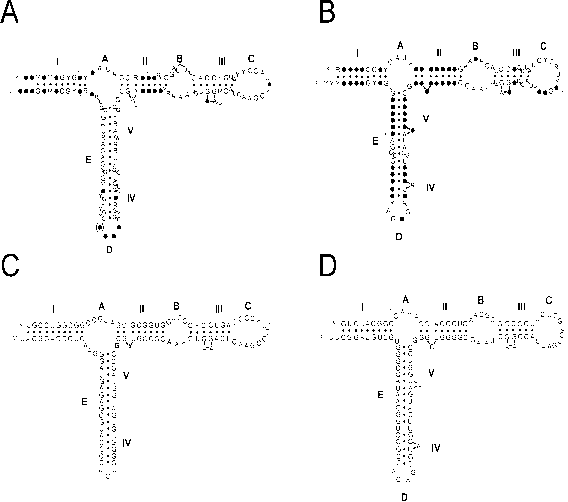 Secondary structure element of E. coli formate dehydrogenase mRNA determining the binding of selenocysteinyl-tRNASec with the A-site-bound UGA codon. The apical part of the hairpin including the end loop is organized into specific tertiary structure with exposed UU (in the stem) and GU (in the loop) directly responsible for SELB binding. At the same time, the basal part including the UGA codon and the adjacent upstream sequence is also involved in a complex and distorted double-stranded structure with the downstream sequence. (C. Baron & A. Bck, in "tRNA Structure, Biosynthesis, and Function", D. Soll & U. L. RajBhandary, eds., p.p. 529-544, ASM Press, Washington, D.C., 1995; A. H.ttenhofer, E. Westhof & A. B ck, RNA 2, 354-366, 1996). determined. A portion of eEF1H in mammalian cells has been found to be firmly complexed also with valyl-tRNA synthetase. The content of EF-Tu (or eEFIA) in the cell is high, and virtually all cellular aminoacyl-tRNAs exist as ternary complexes with this protein and GTP. Both the tRNA and the protein moiety of the complex show affinity to the ribosome. As a result of codon-anticodon recognition, the complex that carries the tRNA corresponding to the template codon binds productively to the ribosome. The selective binding of the ternary complex to the ribosome governed by the codon-anticodon interaction induces hydrolysis of the bound GTP into GDP and orthophosphate; orthophosphate is released. It is likely that the settling of the tRNA residue in the A site on the 30S subunit strongly contributes to the induction of the GTP hydrolysis. This indirect effect may be caused by an interdomain shift within EF-Tu as a result of the tRNA residue movement. (3) RS:mRNAAa-tRNAEF-Tu:GDP->~ RS mRNAAa-tRNA + EF-Tu:GDP. Nevertheless, the eventual result of this reaction is similar to that observed for the fast binding of the ternary Aa-tRNA:EF-Tu:GTP complex followed by the subsequent cleavage of GTP and the release of EF-Tu. The SELB specifically interacts with a 40 nucleotide structural element of mRNA located immediately downstream of UGA codon (Fig. 10.6). Thus the ternary complex is found to be fixed on mRNA at a specific site encoding for selenocysteine. When the translating ribosome encounters this ternary complex on mRNA it accepts the selenocysteinyl-tRNASec at the A site with the UGA codon settled there (Fig. 10.7). The subsequent events seem to proceed in the same way as in the case of the standard ternary complex binding: GTP is hydrolyzed, SelB:GDP complex is released from the ribosome, and the selenocysteinyl-tRNA reacts with peptidyl-tRNA to form the next peptide bond. The ribosome continues translation of the mRNA. In Eukaryotes the UGA-directed incorporation of selenocysteine is determined by a special structural element located at 3'-untranslated region (3'-UTR) of mRNA, far away downstream from the UGA codon. This element is much longer than that of prokaryotic mRNAs and has quite different secondary and tertiary structure. The mechanism by which the 3'-UTR-located element affects the binding specificity of the internal UGA is unknown. What happens if GTP is replaced by its nonhydrolyzable analogs, e.g. guanylyl methylene diphosphonate (GMP-PCP) or guanylyl imidodiphosphate (GMP-PNP)? EF-Tu (as well as the eukaryotic eEFIA) is capable of interacting with the analog and, as a result of the interaction, the protein acquires an affinity to aminoacyl-tRNA. The protein, the GTP analog, and an aminoacyl-tRNA yield a ternary complex which then binds to the ribosome. The next reaction (2), however, does not take place. Therefore, EF-Tu continues to retain its affinity to the aminoacyl-tRNA and the ribosome, and the aminoacyl-tRNA remains on the ribosome in the complex with EF-Tu and the nonhydrolyzable GTP analog. In this case the aminoacyl-tRNA cannot serve as the acceptor substrate in the transpeptidation reaction with the peptidyl-tRNA, and the next stage of the elongation cycle becomes blocked. Fig. 9.14 A). When a nonhydrolyzable GTP analog is used, the aminoacyl-tRNA gets stuck in the intermediate A/T position ("hybrid A/T site") and therefore cannot react with the peptidyl-tRNA. From this GTP hydrolysis could be postulated to provide the energy for transferring the aminoacyl-tRNA from the A/T position to the A/a position (or A/A site after Noller) (Fig. 9.14 b). At the same time, the aminoacyl-tRNA bound to the ribosome in the presence of EF-Tu and a nonhydrolyzable GTP analog, such as GMP-PCP, may be rendered active in transpeptidation simply by mechanical washing away of EF-Tu and the GTP analog. Thus, although the aminoacyl-tRNA is also switched from A/T to A/a position, no GTP hydrolysis is involved in this case. On the other hand, it has been shown that GTP hydrolysis by itself fails to provide the switch to the A/a position, if EF-Tu remains on the ribosome in the presence of kirromycin, an antibiotic that increases the affinity of EF-Tu:GDP to the ribosome (see below, Section 10.3.3). Generally, it seems unlikely that a downhill process (in with permission). Figure 10.7. Model for the incorporation of selenocysteine into bacterial proteins. 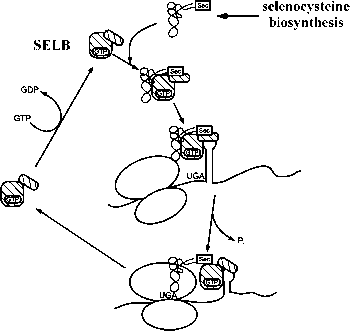 A specialized elongation factor SELB, an analog (and homolog) of EF-Tu, forms the ternary complex with GTP and selenocysteinyl-tRNASec (Sec-tRNA), and also binds to a recognition element within mRNA (Fig. 10.6) which is located at the 3' side of the UGA codon. The translating ribosome runs on this quaternary complex and binds it at the A site. (Reproduced from C. Baron & A. B ck, in "tRNA Structure, Biosynthesis, and Function", D. Soll & U. L. RajBhandary, eds., p.p. 529-544, ASM Press, Washington, D.C., 1995, thermodynamic sense of the word), such as the accommodation of aminoacyl-tRNA in the A site, required GTP hydrolysis energy for performing any useful work. It seems to be more likely that the GTP hydrolysis during aminoacyl-tRNA binding is used for purely catalytical purposes. If EF-Tu is considered as a catalist of aminoacyl-tRNA binding to the ribosome, the concept of the transition state, analogous to the transition state in enzymatic catalysis, may be accepted. Then EF-Tu:GTP has an affinity precisely to the transition state of the aminoacyl-tRNA:ribosome complex. However, in contrast to the case of the enzymatic catalysis of a covalent reaction where the energy for the breakdown of the transition state and the release of a catalist is provided by the catalysed reaction itself, EF-Tu uses a destructible effector, GTP: first GTP induces the affinity of EF-Tu to the transition state of the aminoacyl-tRNA:ribosome complex, and then GTP is cleaved, EF-Tu is released and the transition state converts to the product state. It may be a general rule that a non-covalent catalysis, such as the catalysis of a conformational change or a directed molecular movement, requires a parallel covalent reaction of the ATP or GTP hydrolysis type in order to compensate the energy of the catalist affinity and to complete the process catalysed. Thus, the codon-dependent binding of the aminoacyl-tRNA with the ribosomal A site is catalyzed by EF-Tu protein plus GTP. The catalysis appears to be the result of (1) the binding of EF-Tu together with the aminoacyl-tRNA to the ribosome (the acquisition of a transition state for the ribosome complex), and (2) the subsequent hydrolysis of the bound GTP and the release of EF-Tu (the attainment of a final, or product state). The significance of GTP hydrolysis lies in destroying the effector (GTP). As a consequence of the GTP hydrolysis, EF-Tu changes its conformation, loose the affinity to the ribosomal complex, and dissociates, thereby allowing the final A site binding of the aminoacyl-tRNA to be achieved. The free energy of GTP hydrolysis is dissipated into heat. Numerous specific inhibitors, predominantly antibiotics, are known to block different stages of the ribosomal elongation cycle. Most of these act selectively either upon prokaryotic (bacterial) or upon eukaryotic ribosomes (for reviews, see Pestka, 1977; Gale et al., 1981; Cundliffe, 1980, 1990).